The wooden clock base is covered with medium-weight textural paper. The paper molds easily to the shape of the wood when it is saturated with laminate. Add words that inspire you, a mini wire vase and bouquet of curly sticks. This combination makes a unique art piece for your home. 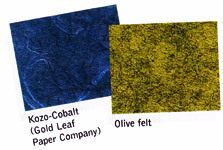 Kozo is of a heavier weight than the typical mulberry paper. The bottom side is smooth and the top side is very textural. Be sure to place the paper so that the texture, fiber side is up. The fibers are slightly lighter than the paper color which adds interest and dimension to the surface, so you don't want to hide it! 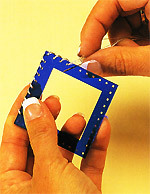 Tear the blue paper into random-sized pieces. 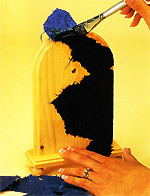 Brush liquid laminate onto the wooden clock base. Cover the entire clock base with paper except for the round feet. 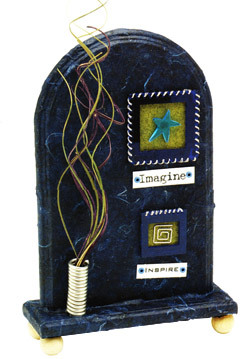 Saturate the paper pieces with laminate as you place them on the wooden base. The laminate will make the paper very pliable. Tear small pieces to fit around the corner and other small spaces. Use the end of the paintbrush to press the paper into the ridges along the sides and arch of the base. With the needle and silver thread, add a whipstitch around the two acrylic frames by inserting the needle through a hole from the front of the frame, bringing the thread around from the back of the frame and then inserting the needle through the front of the frame at the next hole. Trace both of the frames on a piece of olive felt, using a pencil. Cut the felt pieces out. Stitch the square swirl clip to the center of the smaller piece of felt. 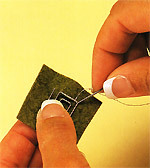 Use a piece of metallic thread and a needle. Tack the clip to the felt in three places. Glue the felt pieces to the back of the acrylic frames. 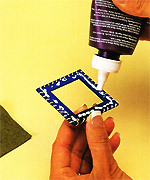 Glue the acrylic star in the center of the larger frame. Let dry. 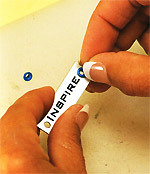 Set blue eyelets into each end of the silver words. Place the eyelet into the hole from the front and then turn the metal word over. Lay it onto a protective surface such as a piece of wood or cutting board. Place the eyelet setting tool in the top of the eyelet shank. 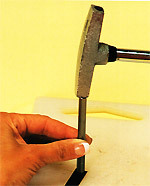 Tap the end of the setting tool with a hammer. This will spread and flatten the shank at the same time. Apply craft glue to the back of each frame and place them on the papered base. Glue the metal words under each of the frames. 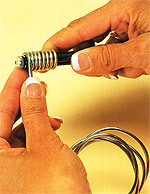 Wrap the solder around the base of a pen to form a tight coil that is 1¾" (4cm) tall. Glue the coil to the bottom left side of the papered base. Cut several purple and green curly grass sprigs 10" (25cm) tall. Wrap the bottom ends of the sprigs with clear tape. Place the sprigs into the wire coil.